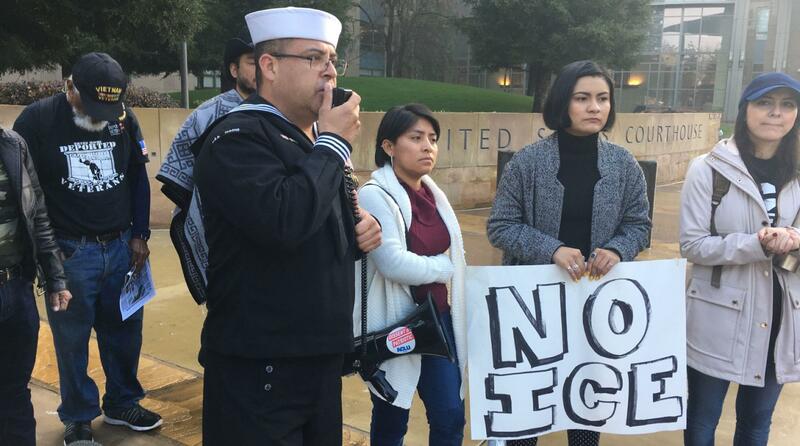 Jose Antonio Sotelo Tarin wears his Navy uniform during a rally in front of Senator Dianne Feinstein's Fresno office. Advocates were calling on the senator to publicly support Sotelo Tarin from being deported. “When I got out of the service I came back with a lot of PTSD and alcoholism, so I did some wrongful decision making and I got in trouble with the law,” Sotelo Tarin says. Now, because of Sotelo Tarin’s crimes, the government is trying to deport him. According to Merced County Superior Court records, Sotelo Tarin spent 6 months in jail in 2008 after being convicted of a felony hit-and-run. He spent another 6 months in jail in 2009 for possessing a controlled substance. Then in 2014, he spent 18 months in prison for drug-related offenses and domestic violence. Sotelo Tarin didn’t comment specifically on his past crimes because his immigration case is ongoing, but he says he’s faced up to the consequences of his actions and takes responsibility for everything he has done. His attorney, Etan Newman, says after Sotelo Tarin was released from prison in 2015, he was transferred to immigration custody. He was detained for about 15 months. “He finally got a hearing in front of an immigration judge who decided he was appropriate for release and that he had shown rehabilitation, that he was committed to continuing his rehabilitation outside of detention,” Newman says. Newman says his client has complied with everything the government has asked for including rehabilitation and has been sober since 2014. On top of that, he’s become an advocate. Sotelo Tarin spoke to legislators at the state capitol about immigrant and veteran rights, Newman says, and even went to San Francisco City Hall to lobby for funding for legal resources for immigrants. Sotelo Tarin says it took years to get the services he needed to deal with his PTSD, and he’s been advocating to make those resources more accessible for veterans in rural areas, like Los Banos. 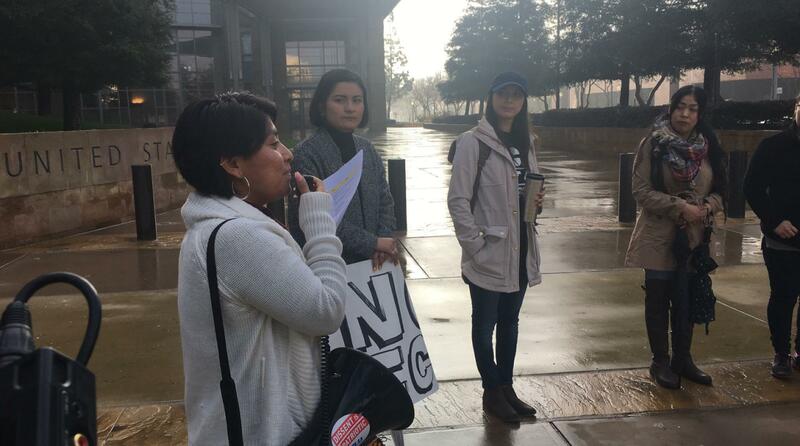 “And yet, ICE has continued since that bond hearing to try and appeal that decision and re-detain Joaquin and keep him in detention throughout the rest of his deportation proceedings and ultimately try to deport him,” Newman says. Sotelo Tarin was born in Mexico but he hasn’t lived there since he was around 9 or 10 years old. When he enlisted in the Navy, he had a green card. But having a green card and being a veteran doesn’t prevent someone from being deported, says Andrew Arthur, a resident fellow of law and policy at the Center for Immigration Studies. “And if Congress wanted to specify that individuals who have served in the armed forces were not removable, they could do so but there’s no exception like that,” Arthur says. The more extensive someone's criminal record is, Arthur says, the greater the chance they have of being deported. 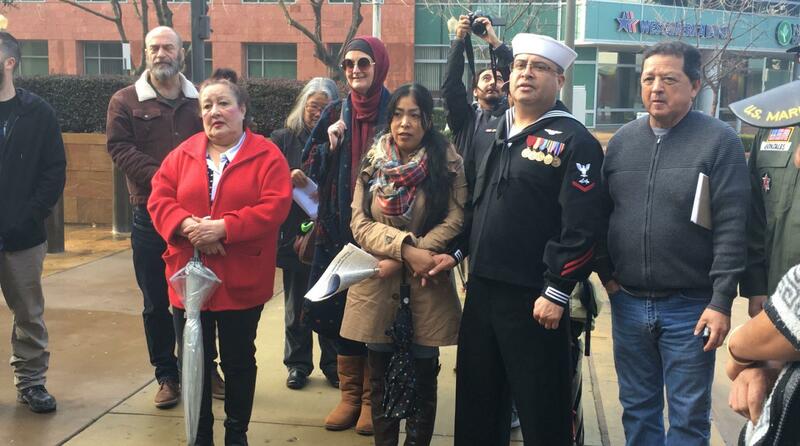 Advocates march to Senator Dianne Feinstein's Fresno office to ask her to publicly support a Navy Veteran who could be deported. 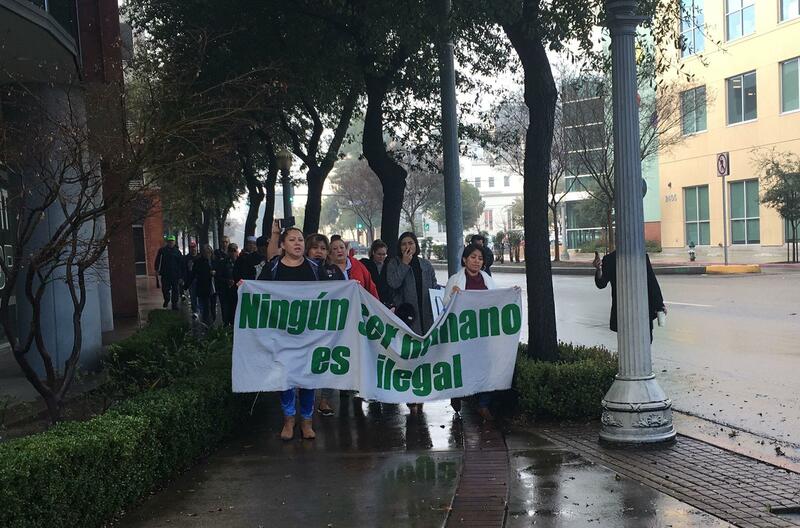 Despite Sotelo Tarin’s crimes, immigrant advocates in Fresno are mobilizing around him. Last week, he was the subject of a rally. About two dozen people marched from Fresno’s ICE office to Sen. Dianne Feinstein’s local office. They were calling on her to publicly support Sotelo Tarin from being deported. A family physician from Merced, Salvador Sandoval, attended and says the veteran has become a leader in his community. Sandoval says Sotelo Tarin’s deportation would be harmful to the community because he represents the kind of person who can turn his life around after making mistakes. Brisa Cruz, who works for California Immigrant and Youth Alliance, helped organize the rally and says asking elected officials to stand in solidarity with immigrants is a way to help people in situations similar to Sotelo Tarin's. Brisa Cruz, with the California Immigrant and Youth Alliance, speaks at the rally in front of Senator Dianne Feinstein's Fresno office. Feinstein’s office says Sotelo Tarin has asked for casework assistance, but the senator won’t discuss details about it because of privacy concerns. However, she only has the power to make inquiries with the Department of Homeland Security on someone’s behalf. She can’t stop someone from being deported. At the rally, Sotelo Tarin told the crowd that when he was in Iraq, he wondered what country would come and look for him if were captured. “If I bleed am I going to bleed the same color of my shemate here around me or beside me?” he asked. “If I get killed, under what citizenship do I get killed? Not only that but if I do kill under what citizenship do I kill? After he was done talking to the crowd, he gave a military salute and walked back to join his wife, mother, and sister. Sotelo Tarin’s next court date is scheduled for February 11.